Galganov's Easy Recipe for 50 % Whole Wheat Pizza Dough! To the yeast mixture, add 1 clove crushed or minced garlic, 4 tsp olive oil, 1 1/2 tsp sugar, 1 1/2 tsp salt, a pinch cayenne, 1 1/2 tsp basil, and 1 tsp oregano and mix vigerously. Stir in the optional 3 Tbsp flax and 1/3 C durum semolina and mix well. Put in between 3/4 and 1 1/2 C whole wheat flour (more than 1 1/2 cups of whole wheat flour and the crust takes on a little bit of a grainy texture. We prefer between 3/4 and 1 cup). Mix very well - about 100 strong strokes with the spoon until the batter is nice and smooth. Add additional flour, 1/4 cup at a time only until the dough no longer sticks to the hands. Knead the dough with a push-and-turn motion until it's silky smooth and begins to feel responsive under your hands - about 5 to 8 minutes (about 5 minutes with a dough hook) dusting it only a bit if it sticks to your hands as you knead. You may, at this interval, wish to oil your pizza pan and prepare toppings for the next step. form the dough to fit your pan, dress your pizza and bake it, on the lowest shelf in your oven (not the oven floor), at 425o F (220o C) until the crust is cooked and the cheese starts to turn golden. The Pizza adventure continues. This time it's in the form of a whole wheat pizza crust. 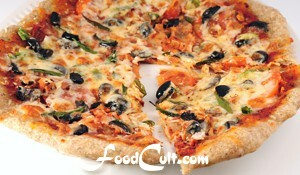 These days dietary health is more forefront on our minds and we don't think pizza has to be junk food. One has the choice to use more health and diet conscious ingredients. Besides, it's fun to enjoy different flavours sometimes. Whole wheat, having almost double the dietary fibre of white flour, is a good choice but we don't think one should have to sacrifice good flavour for healthy food. By using only 50 % whole wheat, this fun food yields an extra 25 % dietary fibre - good deal! To us, 3/4 cup or as much as 1 cup of whole wheat in this recipe provides an optimally textured, fiber enhanced option for this popular fast food entree. Some will like more whole wheat while others will enjoy less. Take the adventure - try it for yourself. We only enjoy a maximum of about 1 1/2 cups of whole wheat in pizza. This recipe uses durum semolina. Durum semolina contributes to the texture of the crust. If this ingredient is unavailable you may need to compensate with a little extra flour but the recipe will still work perfectly well. This recipe also uses milled flax seed as a way to add, to your diet, a little soluble, dietary fibre; omega 3 fatty acids and vitamin E that contribute to the make-up of the flax seed. Doesn't interest you? Leave it out. This recipe will still work properly. Essentially, all herbs and spices are optional - we like the flavours they contribute to the pie. This recipe does prefer at least some salt and sugar although these ingredients may be reduced a bit.